Another film which is based on a true story. Sharpeye tells how 11-year-old Whalen spots a dinghy of the Special Forces which is part of an exercise. They plan a surprise attack on a community but are outdone by the whole community springing into action. The film is a tribute to all Indigenous peoples serving in the world wars. 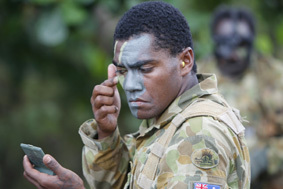 Director Aaron Fa'Aoso about his film: "In the early nineties an Army exercise took place in the Northern Peninsula communities of Bamaga and Seisia, between the local Torres Strait/Aboriginal 'Charlie Company' reservists and the SAS. "The local community became involved as well, helping to monitor any strange activities or individuals. With the use of traditional language, the local radio station and help from all five communities, the Charlie Company boys were able to beat the world's elite soldiers at their own game. The big boys play it tough in Sharpeye. Sharpeye is set in the Torres Strait Islands. 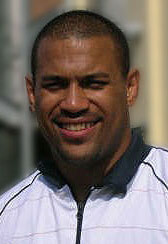 Aaron Fa'Aoso grew up in the Torres Strait Islander communities of Seisia and Bamaga, at the tip of Cape York. Aaron Fa'Aoso made his acting debut in the RAN (Remote Area Nurse) mini-series for which he was nominated for the Graham Kennedy award for most outstanding new talent. The former health worker and ex-footballer was born and raised in the tropical city of Cairns by his mother, a career public servant.